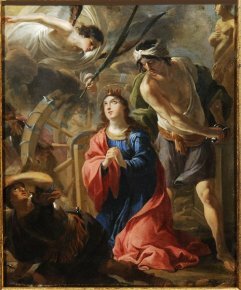 A work by Jacques de Létin painted on copper, The Martyrdom of Saint Catherine of Alexandria (ill.), belonging to a New York art dealer was stolen on 25 May 2012 from the premises of a Parisian art gallery. Anyone with knowledge concerning this theft should contact the Office central de lutte contre le trafic des biens culturels (OCBC) or The Art Tribune which will forward the information. Thanks to this announcement published in La Tribune de l’Art on 3 June 2012, the painting was recovered three days later on 6 June. To publish a work in the section Art Thefts Announcements see here.